The Many Mini-Adventures of the Wards: What are you watching? Here is our latest TV obsession. Alias. This TV show finished airing in 2006, but we started watching season 1 about two months ago. We were hooked from the first episode! So far, season 3 was our favorite. Oooooh, Sark and Lauren were soooo evil! Last week we began season 4 and are about to begin the final disc. Soon, we will be finished with this series and will need something new to occupy our time. Anyone else share our Alias obsession? Any suggestions for series that are similar to this one? What are you watching these days? I looooved Alias - we also watched it on DVD and it was FABULOUS. Sorry, I don't have any other suggestions...but I bet the Heasleys would have some good ones for you!! 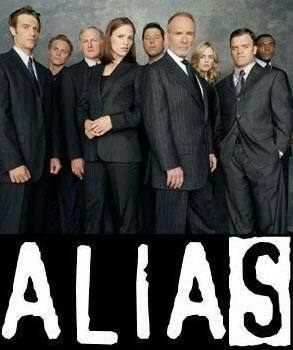 SOOO loved Alias and to date it is still my all time favorite show! I love Jenifer Gardner and Matthew Vartan. If you never got into the 24 series it is pretty good and is now over and can be watched on DVD. We watched Alias a couple of summers ago. We also loved it!! So far its been one of our favorites. I also suggest 24.